Place the vehicle on a suitable stand so that the sidestand is elevated. • Sidestand vertical movement "A"
Free play is noticeable -> Replace the defective part(s). • Sidestand axial movement "B"
If there is Unsmooth Operation -> Replace the defective part(s). a. Tighten the sidestand nut " 1 " to specification. b. Check the sidestand vertical movement "A" by moving the sidestand up and down. c. Check the sidestand axial movement "B" by moving the sidestand up and down. 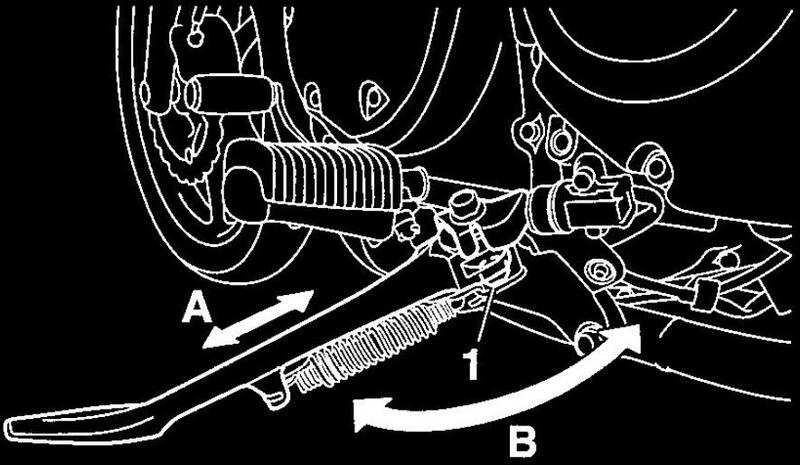 Lubricate the pivoting point, sidestand bracket pin and metal-to-metal moving parts of the sidestand.